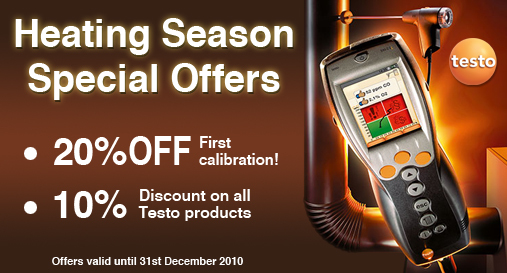 Butler Transtest Ltd, the calibration division of the Maynooth based Butler Group, is offering customers a 20% reduction off the first calibration of any Testo flue gas analysers purchased and a 10% discount on all Testo products bought between October and December 2010. The offer is applicable to all Testo products including Pressure Meters, the Testo Pocketline Range, Flue Gas Analysers, Digital Smoke Testers and Gas Leak Detectors. There are great savings to be made on the purchase of the new Testo 330-1 LL, Testo 335, Testo 327-1 and Testo Fast printer. For the full Testo product range Click Here. Transtest is a leader in Calibration Services in the Irish market since 1998. Butler Transtest Ltd has developed its accredited calibration services and expertise into a number of different markets over the last number of years, servicing customers within Aerospace, Green Energy, Pharmaceutical, R&D, Life Sciences, Telecommunications, Broadcast, Utilities, Government, Education and Services. Butler Transtest’s ISO 17025 laboratory in Maynooth has accreditation in Electrical Temperature and Pressure Calibrations and offers a wide range of calibration services which can be provided both in their state of the art laboratory and on site. Butler Transtest Ltd is the Calibration Division of the Butler Group, a leader in the provision of components, instrumentation and engineering solutions to a number of different technology driven markets within Ireland.